West Java has passed down, through their folklore, that the Egyptians once visited their island. They even have a stone carving that supposedly depicts an Egyptian bowing down to an Indonesian. The early presumption of a Pyramid existence in this country began with a series of Turangga Seta expeditions conducting mapping of reliefs in Candi (Temple of) Penataran (Blitar, East Java) from 2007 to 2009. The colonization of Indonesia by the ancient Egyptians is fully documented by Sir Thomas Stamford Raffles in his volume, The History of Java - John Murrey Publishing, London - 1830. Tomb paintings and writings show that the Egyptians were trading down the Red Sea and into the Indian Ocean before 2000 BC. They made regular excursions to Lebanon before 2500 BC for cedar. During the reign of female pharaoh Hatshepsut (1503-1482 BC), ships 90 to 100 feet long were sailing to and from the Land of Punt... David Pratt, Aug 2011- http://www.davidpratt.info/americas1.htm . This paper details the results of a geoglyphical study of the newly discovered Lalakon and Satahurip Pyramids in West Java, Indonesia. The origin of these structures will be studied using spherical geometry to follow the bearings created by the ridge detail designed into the pyramid. The practice of using the geometry of ancient structures to release hidden details of their purpose is not a new practice. This practice has been handed down through generations since before the building of the Egyptian pyramids. I call the re-discovery and application of this ancient practice Geoglyphology. One function of Geoglyphology, as it relates to Archeology, is to expand both the search area and the knowledge base available to the Archaeologist. Until now the majority of the information available to the Archaeologist is gleaned from the information recovered at the dig site. In recent years it has been discovered that a great majority of the ancient architectural, monolithic and geoglyphic structures built around the world have something in common. That commonality is that the structures were aligned in such a manner that the study of their linier alignment unveils a much larger story and immensely expands the data available to the archeologist and the related disciplines. Data recovered from sites that included Geoglyphology in their study included; Obtaining the geographical range of the culture being studied, the level of sophistication that existed in relation to their understanding of mathematics and geometry, their knowledge of world geography, the discovery of other archeological sites that were unknown prior to the studies, and the dating of the culture itself from the data collected at related offsite locations, identified by the alignments at the dig site. The success of these studies shows that Geoglyphology can play a major role in expanding the knowledge base available to the Archeologist. More information on Geoglyphology can be found at www.thefaramfoundation.com . Note: The calculations performed during the writing of this paper required the use of software called "Google Earth". Google's software is able to calculate true spherical bearings on the curved surface of the earth and then display them correctly on a flat plane. The endpoints of all radials were determined using the Google Earth software prior to being presented here as straight lines. Therefore, the curvature of the earth that would normally exist in the lines is absent. Bosnian Pyramids - (26,400 BC) These pyramids originally outlined what is now known as Europe and Africa and Canada. This was later amended by pyramids being constructed near the original Bosnian Pyramid of the Sun which reduced the described territory to include only Europe. The Celts were later driven, by other civilizations, west into Western Europe and Denmark. 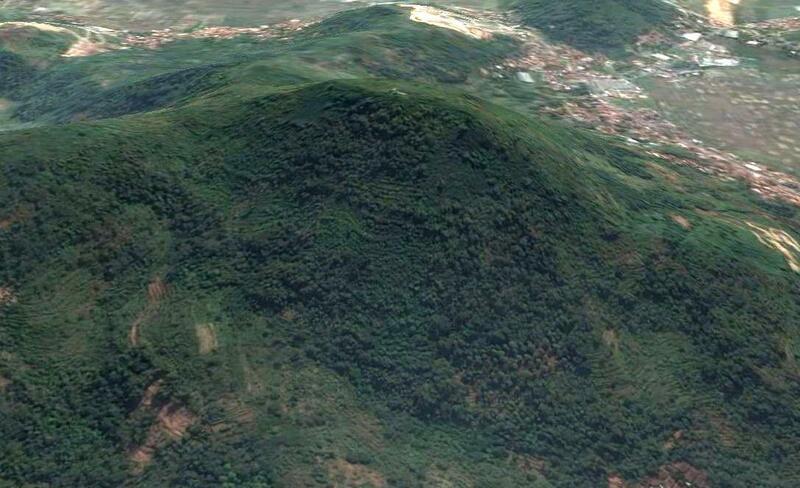 The Bosnian Pyramid is the oldest and largest pyramid discovered thus far. The boundaries that were originally outlined by the pyramids and structures in ancient times have been broken up into smaller and smaller territories, countries and states as time has passed. Yonaguni Pyramid - (c10,000 BC) This pyramid outlines the same territory which Japan was attempting to re-establish in the Second World War. Lalakon Pyramid - (Not yet dated by an onsite study.) The construction of this pyramid is very similar to the unusual construction used in the Bosnian pyramids. Caral, Peru - (c10,000 BC) Outlines the territory known as South America. Gulfo de Cintra Geoglyph - (Built before 7000 BC) The Gulfo de Cintra geoglyph was the territorial marker prior to the Giza Pyramid being built. The age of the geoglyph is confirmed by the fact that the Nabta Playa geoglyph in Southern Egypt, which has been dated as being 7000 years old, points to the Gulfo de Cintra geoglyph. The Gulfo de Cintra Geoglyph points back to Nabta Playa. Inspiration Peak, Minnesota USA - Older than 3100 BC, as determined by its location being identified by one of the radials of Stonehenge. Inspiration Peak originally depicted a territory covering the entirety of North America and Mesoamerica. This too was divided up through historic battles and treaties.border. The reason the age of Inspiration Peak cannot be determined to be older than c3100 BC is because the oldest confirmed reference to the this marker is Stonehenge (c3100 BC), which points out Inspiration Peak as being the center point of the adjoining territory. It is a common protocol for the ancients to include one bearing in a major monument which points to the geoglyph outlining the adjoining territory. As will be shown, the Indonesian pyramids validate the ancient territories of South America, Mesoamerica and North America, later to become the United States. In this case Luxor, the main spiritual location of the Egyptians, is pointed out from the Indonesian Lalakon Pyramid and what is now England is pointed out by the Indonesian Sadahurip Pyramid. This reference to Luxor and England is pointing out the territory on one side of the subject territories as being Africa and the territory on the other side of the subject territories being England. This in itself may give a clue as to the age of the two pyramids. Caral, Peru, which is 7,000 years old, is referred to directly as the survey marker defining the South American Territory. Stonehenge, the current marker for the Celtic Territory, Giza, the current marker for what is now Africa, and Inspiration Peak MN, the current marker for what is now the United States, are not referenced here. The indonesian pyramids point to Luxor rather than Giza, and to the north tip of England instead of Stonehenge, and the island of Newport, RI instead of Inspiration Peak. This would be the case if the Indonesian Pyramids were built prior to the afore mentioned territorial markers having been built. All three of the markers mentioned were constructed after 3100 BC. That would mean that the Indonesian Pyramids would have had to have been constructed between 7,000 BC, the established age of Caral Peru, and 3100 BC a date prior to Stonehenge, Giza and Inspiration Peak being established. 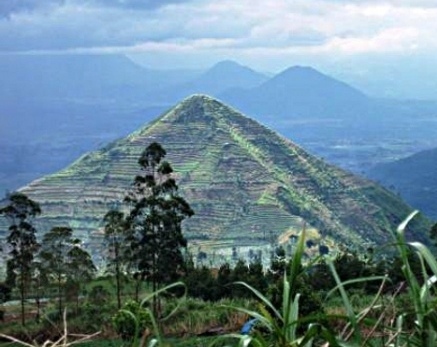 That would place the Indonesian pyramids age at between 5000 and 12,000 years old. It will be interesting to see what the actual age of the pyramids will be calculated to be. Although current information prohibits the dating the Indonesian Pyramids prior to the Ice Age, the construction is similar to the Bosnian Pyramids which date to before the Ice Age. Stonehenge - (c2900 BC) Depicts the territory from the west coast of Europe to the west coast of what is now Canada. Giza Pyramid - (c2560 BC) Claims the territory of Libya (The ancient name for Africa). In addition, Egypt is referenced throughout geoglyphic history as the focal point of a coalition which includes five territories mentioned previously. Chichen Itza, Mexico - (c600 AD) Outlines the territory of Mesoamerica, the Caribbean and the Gulf of Mexico. Several other territories have been studied and confirmed in other parts of the world, such as the Pyramids of China, but the main focus here are the combined territories of the areas highlighted in the study of the Lalakon and Sadahurip geoglyphs. The Lalakon Pyramid is rather dismal sight in comparison with most other pyramids of the world. 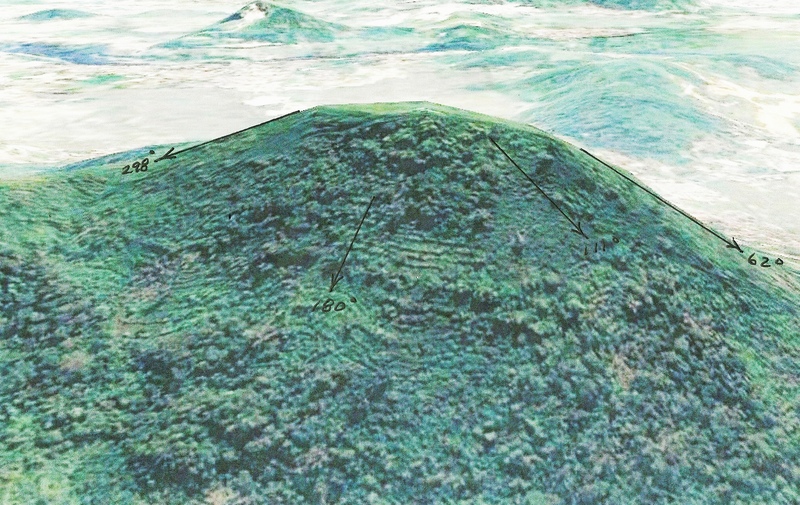 The pyramid has degraded from attacks by the monsoons that are prevalent in the area. One thing that detracts from its majesty is the fact that, just like the Bosnian Pyramids, this pyramid is cut out of a ridgeline. This was really quite brillient. This would allow the builder to carry the unused earth that was removed from the structure downhill. That appears to be what was done here. On the northeast side of the pyramid there appears to be an unnatural amount of earth in a continuous slope down to the valley below. Our research shows that the pyramid does have four ridges but that they are not symmetrical. Experience has shown that non-symmetrical pyramids are primarily used to denote direction rather than being constructed as a monument. These directional ridges are used to outline a territory, convey a message, or to memorialize where the builder was from. Since the Lalakon Pyramid was not constructed of stone, or covered with a stone facing, the earth has worn away the ridges over the years until it is barely recognizable as a pyramid. 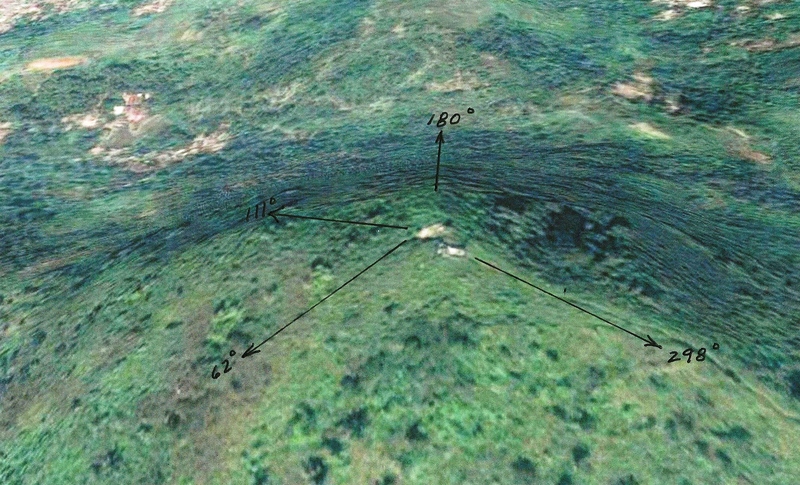 This makes it more difficult to determine the location of the ridges from which to determine the directional bearings. These bearings will indicate the territory, or important points, which the builder intending to communicate. In this case a topographical study was performed to determine the highest points on the pyramid. If there are ridgelines they will then become visible. Some ridges may not be perfect due to erosion but the original line can be determined. After close examination it was determined that there were four ridges on the pyramid which were aligned along the bearings of 62, 111, 180, and 298 Degrees. Another confirmation that this is a legitimate geoglyph is the fact that it contains a cardinal bearing in its makeup. This is the ancient protocol for verifying that this is a true geoglyph. It was now necessary to use special software, Google Earth, which computes using true north for the full distance of the radials to the intended destination. That route cannot be plotted on a flat map because when you transition a map from a sphere to a flat plane, severe distortion occurs. Magnetic bearings cannot be used due to the magnetic deviation that occurs when using magnetic headings. The results of our findings follow. Endpoints for the bearings displayed in the above photos. The four endpoints listed above most likely do not mean much to the reader. As the following information will attest, the Lalakon and Salahurip pyramids, and most likely the many other earthen pyramids in Indonesia, have ties to Egypt. The radial endpoints presented here have been used for millennia, so these are not new concepts. The intersection of the points concerning two or more geoglyphs is not unusual since many termination points are used many times over in presenting this ancient information. The results that follow show an intentional conveyance of information connecting Egypt the Americas and Asia. The time period in which the Indonesian pyramids were built can only be determined by an onsite excavation, which is highly recommend. 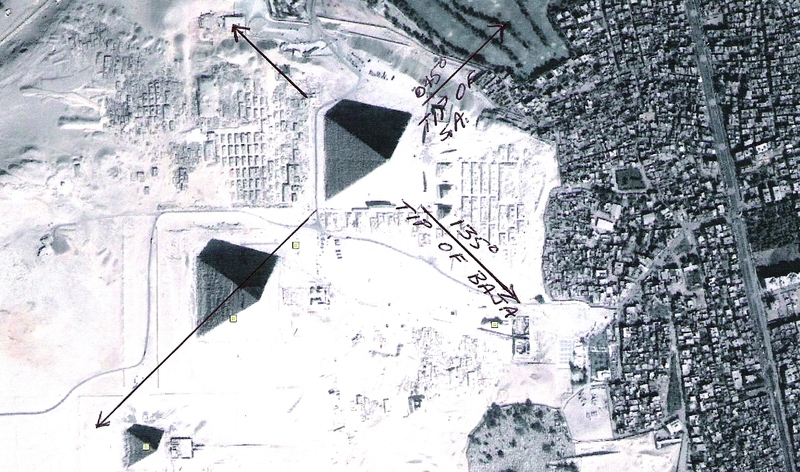 The 045 and 135 degree radials where they leave the Giza pyramid. The 045 and 135 radials are the only two radials that emanate from the Giza pyramid and meet the protocols of the ancients. There are however many minor geoglyphs around the world which point to Giza and validate it's geoglyphic purpose. In one of our studies we found that the 045 and 135 degree radials, emanating from Giza, played an important part in defining the boundaries of Celtic territories, later depicted by Stonehenge. In this study we found the same radials used in the Lalakon Pyramid to highlight the territories of the Americas. I'm sure that as we gain more knowledge these radials will come into play again. The multiple ridges on the sides can be clearly seen. 008 Degree Radial - Cape Hatteras - Eastern most point in the North American Territory, later to be the USA. 037 Degree Radial - Northwest Corner of the North American Territory, at the boundary between the US and Canada. 043 Degree Radial - Tip of the Yucatan Peninsula, Mexico - Location of Chichen Itza, the center point for the Mesoamerican territory. 131 Degree Radial - Center of the Meteor Crater associated with the South American Territory, as defined by the Caral, Peru Geoglyphs. 163 Degree Radial - Caral Peru - Center point of the South American Territory. 180 Degree Radial - Southern Tip of South America - Southern point in the South American Territory. 253 Degree Radial - The point Where Panama Meets Columbia (East Side), The border between the Mesoamerican Territory and the South American Territory. 275 Degree Radial - The point Where Panama Meets Columbia (West Side), The border between the Mesoamerican Territory and the South American Territory. 329 Degree Radial - North Tip of Scotland - The Sadahurip pyramid was most likely built before Stonehenge, the current marker, was built. 360 Degree Radial - Newport Island, RI USA - Mentioned in Geoglyphs as old as 7000 years. One of the major survey markers for the North American Territory. 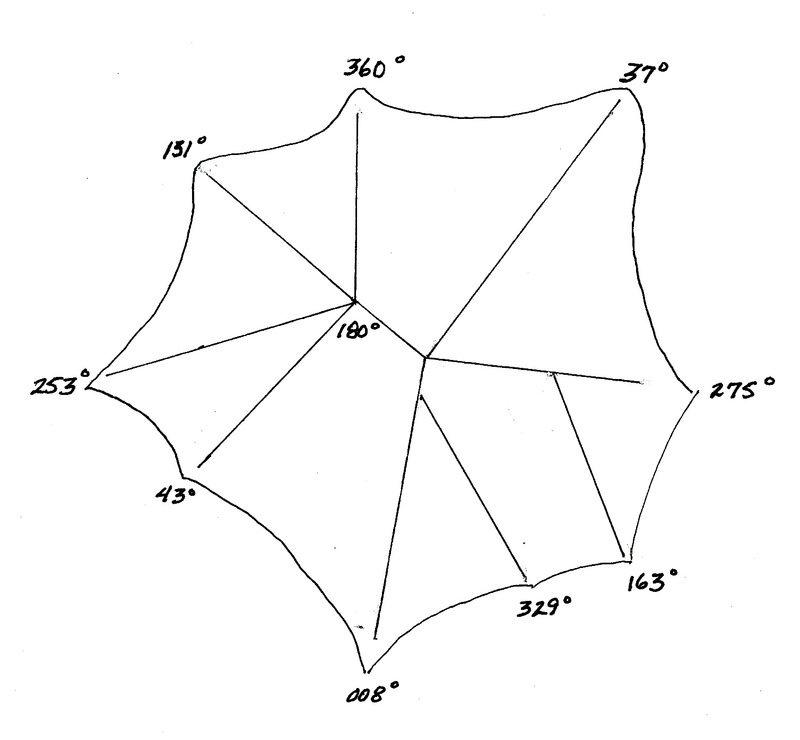 In the previous diagram the curvature of the lines is missing since they were drawn on a flat surface; however, all lines were plotted on a computer, using the great circle route, before they were placed on the map, using the endpoints. 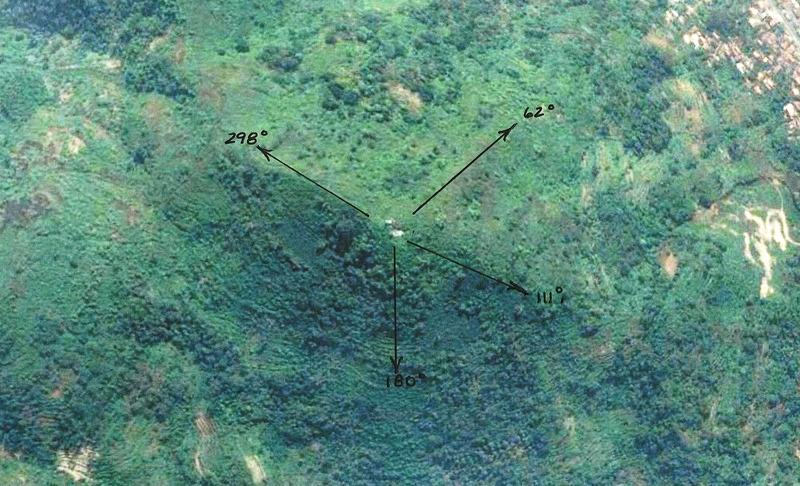 If you will refer back to the previous photos showing the radials that make up the three territories, you will see that the center survey point for all three territories of the Americas is pointed out by the Sadahurip Pyramid. In the next photo the radials of both the Lalakon and Satahurip Pyramids, and the Giza 045 and 135 degree radials, are plotted together in one diagram to demonstrate that they are not an anomaly but were carefully crafted to point out a relationship with the three territories of the Americas. An Ancient North American Territory that would eventually become the USA. 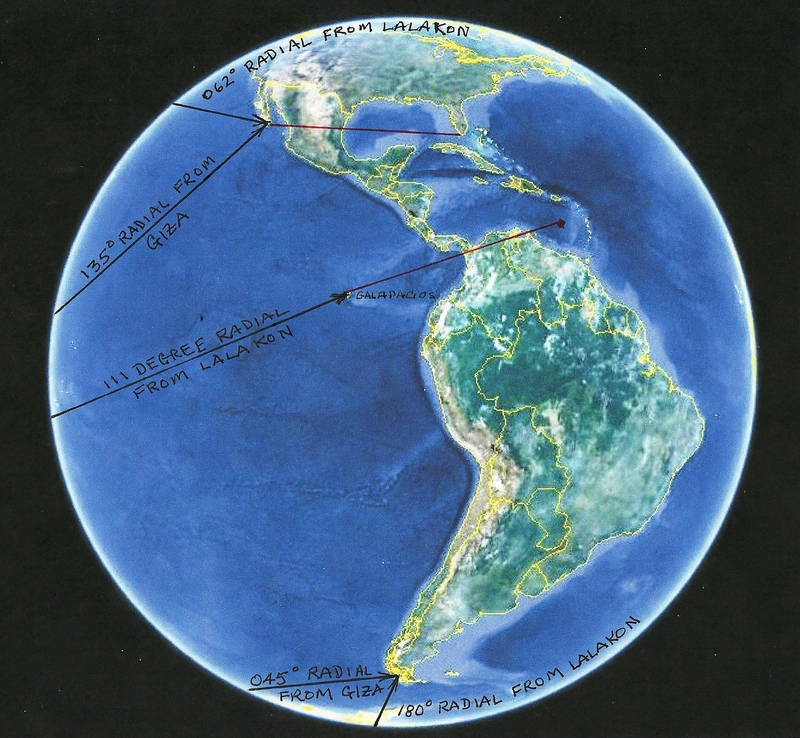 The area is explained is defined by the small arrow at the upper northwest point on the globe, the line pointing to the eastern most point in the USA and the redline running just south of Florida to the Baja Peninsula. The original North American Territory ran from the equator to the North Pole. The Lalakon, Sadahurip and Giza Pyramid Radials Combined. The data that were gathered show a definite global pattern and a sophisticated mastery of geometry. 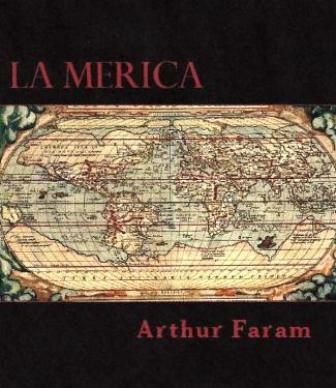 The interaction and display of a worldwide connection between territories leaves no doubt that an ancient culture left markers, intentionally or unintentionally, for later generations to discover. Smaller geoglyphs around the world, discovered in previous studies but not mentioned here, support and validate a continuous progression of the protocols used here as having being passed down, from generation to generation, for millennia. This information is verifiable and repeatable by anyone with a computer and the desire to validate the information. In the name of science and mankind this information should receive further study. Suggested keywords: geoglyphs, spherical geometry, lalakon pyramid, satahurip pyramid, indonesia, west java, yonaguni pyramid, kensington runestone, newport tower, stonehenge, caral peru, giza pyramid, nabta playa, chichin itza, west java history, inspiration peak, topography, platos critias, turangga seta expeditions, ancient signposts, indonesian history, history of egypt, luxor egypt, treaty of hidalgo . The revelation of an ancient science that has marked the territories of ancient cultures for over 10,000 years. Over 150 graphs and photos to illustrate the points made in the book. To order from Amazon.com, or to review the contents of the book, click below. To schedule a presentation at your function - please click here.